"Can’t parking lots be aesthetically pleasing, environmentally and architecturally responsible? Used for something other than car storage? Ben-Joseph shows us that they can. He provides a visual history of this often ignored urban space, introducing us to some of the many alternative and nonparking purposes that parking lots have served -- from RV campgrounds to stages for “Shakespeare in the Parking Lot.” He shows us parking lots that are not concrete wastelands but lushly planted with trees and flowers and beautifully integrated with the rest of the built environment. 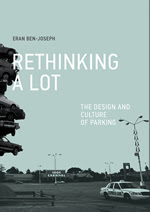 With purposeful design, Ben-Joseph argues, parking lots could be significant public places, contributing as much to their communities as great boulevards, parks, or plazas. For all the acreage they cover, parking lots have received scant attention. It’s time to change that; it’s time to rethink the lot." From ugly eyesore to aesthetic asset? Nice!